NBAGR is the nodal agency for the registration of newly identified germplasm of the livestock and poultry of the country. Newly identified breed is approved by Breed Registration Committee headed by Deputy Director General (Animal Sciences), Indian Council of Agricultural Research (ICAR) and represented by National Biodiversity Authority, Department of Animal Husbandry, Dairying & Fisheries (GoI), Assistant Director General (ICAR), Directors of ICARs species specific animal science institutes and NBAGR. Newly identified breeds are well adapted to the local climate and thrive better in adverse environmental conditions and nutritional scarcity. As a well-known fact, our indigenous breeds have been found to have certain unique characters. Like indigenous cattle possess some specific milk protein type which is more beneficial for human health than milk from exotic and crossbred cattle. It is supposed these breeds may also have certain uniqueness, NBAGR will work to identify the genetic peculiarity conferring these unique characters. Kalahandi buffaloes are dual type; used for milk and draught purpose in Kalahandi and Rayagada districts of Odisha. 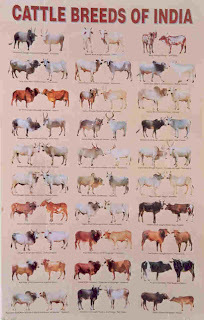 Animals are medium sized; having long, strong, half circled horns with broad base; and are excellent in heat and drought tolerance. Kosali is small sized, draft purpose cattle breed of Chhattisgarh. Farmers prefer bullocks of this breed for cleaning of weeds from paddy field. Animals are known for very efficient working ability and high disease resistance. Pulikulam cattle are maintained in large migratory herds in Madurai and nearby region of Tamilnadu. Utility is draught and manure. These cattle are used in games like bull riding (Jallikattu) in local area. Breed is more resistance to communicable and parasitic diseases as compared to crossbreds under hot and wet conditions. Malnad Gidda is a short statured cattle breed from Western Ghat of Karnataka. Breed is reared for milk and manure purpose. Animal have excellent endurance power and resistance to diseases. Konkal Kanyal goat is meat type breed adapted to high rainfall and hot and humid climate of Konkan region of Maharasthra. Animals have typical white bands on black face and black ear with white margin. Berari goat is also reared mainly for meat purpose in Vidarbh region of Maharashtra. As a unique feature, animals have light to dark strips on lateral sides from horn base to nostrils of face. Ghoongroo pig is reared for pork and manure purpose in Darjeeling and nearby Tarai area of West Bengal. These pigs are black coloured and have upwardly curved snout and large heart shaped ears. Niang Megha is a pig breed from Garo, Khasi and Jaintia hills of Meghalaya reared for pork and bristle purpose. The animals have typical wild look with erect bristles on dorsal midline and small erect ears extended vertically.